As ancient as civilization itself, pretty blue or white flax flowers have waved over fields tended by every population of the globe from Swiss settlements ten thousand years ago, to the ancient Egyptians and prehistoric Native Americans. Perhaps the Israelites encountered it during their captivity in Egypt, for the cultivation of flax is written of in the Talmud and Bible. The Roman writer Pliny says of it “What department is there to be found of active life in which flax is not employed? And in what production of the Earth are there greater marvels to us than in this?” From the Middle Ages onward almost every home in Europe created their own linen from flax, and early American settlers were required by law to spin a certain amount of flax yarn every year or pay a fine. The plant is the source of flax fibre, which is used to make linen, and flax seeds, called linseeds. When pressed, linseeds release thirty-five per cent of their weight in oil; the leftover “cake” is a useful animal feed. Canada is a major producer of linseed. Linseeds are edible, and can also be used in a poultice for rheumatism and infection. Linen is the most famous product of flax, but other applications include linseed oil as a furniture varnish and ingredient in paint formulas, and things like waterproof oilcloth and linoleum, which were common household items until they were replaced by plastics. 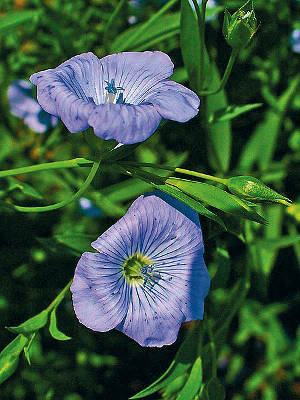 Flax should be sown in the spring, in moist fertile soil with good drainage. It must receive full sun. Rake a half-inch of soil over the sown seed, and keep moist. Flax sown for its fibre should be sown close together; that for seed, further apart. Germination will take about two weeks, with bloom about two months after that, and harvest a month later, about one hundred days from planting. An enduring plant that has served us well in the past, flax may become popular again in the future for its versatile and ecologically sustainable applications.